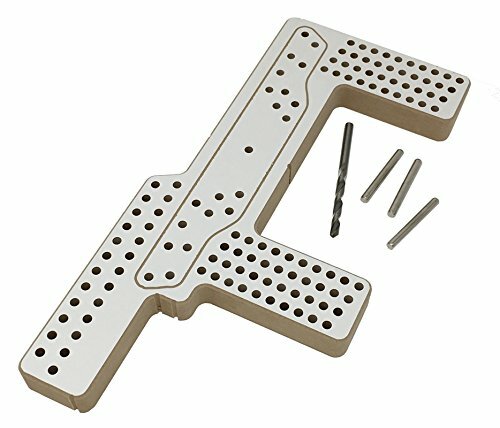 Hardware Horse Drill Jig – Furniture Handle Installation Template for Cabinet Knobs & Pulls – Alignment Guide for Doors & Drawers by Desunia at N Online Agency. MPN: DHS-FPL. Hurry! Limited time offer. Offer valid only while supplies last. FITS 99% OF ALL PULLS - Pre-drilled with 11 of the most common width cabinet pulls. From 2 1/2" up to 8". See description below for details! SET IT & FORGET IT - It's reversible! Just set it once, then flip it over as needed for all left/right & top/bottom doors! DEAD-ON PARALLEL SIDE OFFSETS - Create any side offset from 1/2" to 4" in increments of about 1/16". Side offset holes are drilled so they're perfectly parallel. Say "Good Bye" to crooked handles! WORKS ON DRAWERS TOO - Quickly and easily drill to the center of a 7" tall drawer. Just find the middle of the drawer, align with center mark of jig and start drilling!